Thrown out of Fillory and back in the non-magical world, Quentin Coldwater retreats to his former magical university in Brooklyn. Brakebills. He becomes a professor where he teaches his discipline, described as ‘mending small things’. Remember this, it will be important later. 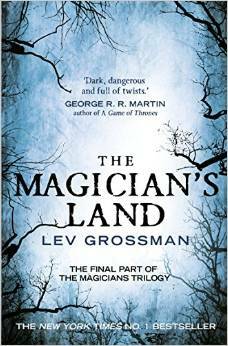 This is the final book of the trilogy by Lev Grossman and like book two, The Magician King, this final instalment is action-packed. The story moves between present and past, Fillory and earth, above ground, in the air and underground. Seeking adventure, and money, Quentin meets a new group of underground magicians and accepts a task for payment of $2m. On the team is Plum, who admits she once attended Brakebills too. In parallel we get the stories of Quentin, Eliot [still in Fillory] and Plum. In order to understand the threat in the present, we have to go back in time to fill in the real story of what happened to the Chatwin children [whose true adventures inspired the novels of Fillory]. And it becomes plain that the Fillory known by Quentin from his childhood love of those novels, is incorrect. The novels were fictional and Fillory is not what it seems. Depending on them all, is the very existence of Fillory.